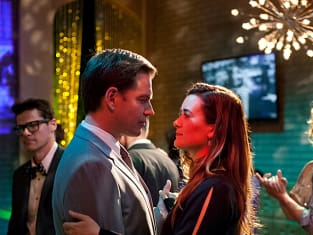 After an NCIS episode that brought us some of their best moments together yet (see our NCIS review), Tony and Ziva were sideswiped by a black vehicle and the agents' status remains unknown. Also, Ilan Bodnar is still in the wind, and Mossad's new director is as complex as they come. There are plenty more shocking moments on the way, she said of the current and complex story arc, including a few between Tony and Ziva, for whom she teased some “messy” times ahead. Last night, of course, was anything but. While de Pablo remains reluctant to define the pair’s "complex" relationship too clearly, she loved the fact that the episode gave the duo a chance to reveal different sides of themselves to one another. “There is a level of vulnerability that’s being shared. We usually see the woman from Ziva and the boy from Tony, and here we see the little girl in Ziva and the man from Tony," she adds. The actress calls the dance scene one of her favorites: “Michael (Weatherly) and I crafted that scene. We felt the moment was very intimate, and we thought that just looking at each other was enough." "The director kept saying, ‘No, I want the moment to be longer,’ and we had to sort of fight the director."